Switch the LDR and 4.7K resistor. Pin 6 is floating.. connect pin 6 with pin 2. (By doing so you are connecting inverting and non-inverting comparator together. and change the 4.7K resistor with 1M ohm variable resistor . Slowly change the resistance and adjust the sensitivity based on your ambient light. Not the answer you're looking for? Browse other questions tagged switches schematics or ask your own question. Why is my dark activated circuit not working? 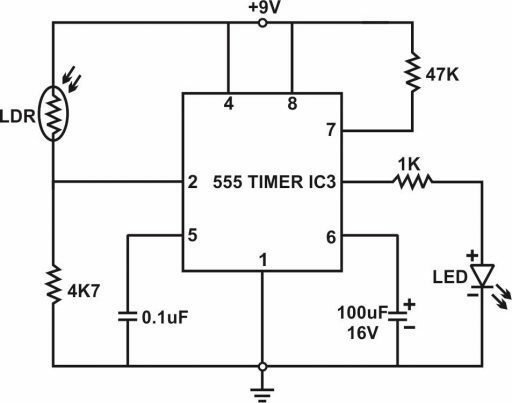 Can I convert a toggle switch to momentary switch using a transistor and capacitor? How do I build a light-activated motor?